When I started mountain biking a couple of years back I also bought myself a GPS device made by Garmin. Cool hardware, but I was definitively not satisfied with the kind of maps that are available from Garmin and the way they establish their digital rights management for the maps they sell; neither user nor customer friendly. So I was looking for alternatives. Obviously the big players came first to my mind, but I wasn't happy with their license model for the geo data (including the information that was entered by users). After a short investigation and an article in a german computer magazine I came across the OpenStreetMap project. Here I can freely access the data base at the granularity I need, get updates from the data base whenever I require and also can add/manage/share the geo information that I collect (based on the Creative Commons Attribution-ShareAlike 2.0 license). 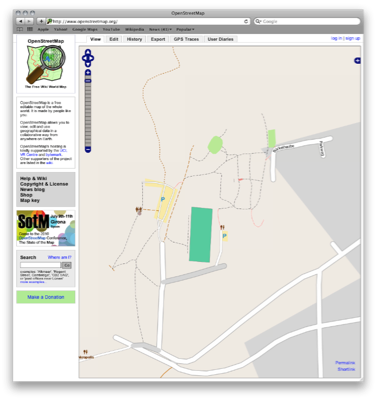 In addition and with the help of tools that are available via the OpenStreetMap Wiki I can convert the data to maps which I can then use on my GPS devices. Here an example of a mapping session that took place in Gruenstadt (Germany). The left picture shows the map as it looked like before adding the information to the planet data; the right one shows the same area after editing the tracked GPX data with JOSM and uploading it to the openstreetmap DB.